I love Mexican food and anything with corn chips! So this recipe is right up my alley. 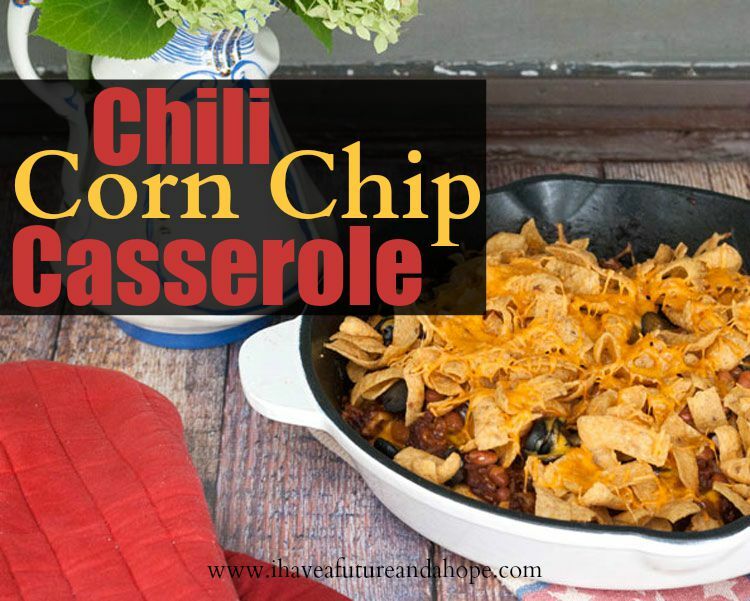 This delicious recipe Chili Corn Chip Casserole is sure to be a family favorite. Plus it’s easy for the chef as well. With football starting this is also great for those game time parties. Let me know what you thought of this recipe! Brown beef in oven-safe skillet. Add in onion, chili seasoning, tomato paste and water. Heat on simmer for 10 minutes. To use one dish, move 1/2 of the chili mixture over to the side of pan (or scoop out into a bowl) and add 1/2 of the corn chips, 1/2 of the beans and 1/2 of the olives and cheese on top of the half of the chili mixture left in the pan. Next, top that layer with the remaining 1/2 of the chili mixture. Add the remaining beans and olives. Top with remaining 2 cups of corn chips, and then the remaining cheese. Bake in a preheated 350-degree oven for 30 minutes. Uncover, and then bake for an additional 10 minutes. To use one dish, move 1/2 of the chili mixture over to the side of pan (or scoop out into a bowl) and add 1/2 of the corn chips, 1/2 of the beans and 1/2 of the olives and cheese on top of the half of the chili mixture left in the pan. Net, top that layer with the remaining 1/2 of the chili mixture. Add the remaining beans and olives. Top with remaining 2 cups of corn chips, and then the remaining cheese.